A long red ribbon which can be tied into a knot. Crystal embroidery on the neck and bust. This is how the dress looks in all angles. Diamond or crystal earrings will make the look fantastic, a great necklace will also compliment the dress, and a tiara is partially required because the look can also be nice without the tiara. But a tiara will certainly enhance this look. Therefore, it is wise to always wear a tiara if possible. A shiny crystal or diamond bracelet will be recommended. 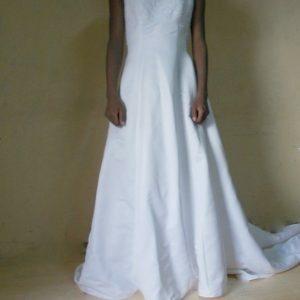 The halter neck wedding dress will stand out on any crowd. Whether the crowd consists of many guests or just a few. The groom can wear any style but as I mentioned above, a white tux with a red vest looks appropriate.The maids can do dresses with little red details. The flower girls similarly with some red details. The venue can have red flowers or red decorations with a mixture of red flowers. This will ensure that the theme is followed. When it comes to photography, your look will certainly be good because this dress is guaranteed to give the best appearance if it is worn by the appropriate body shape. Accessorize with our recommendations or still be creative and do it your way. Either option will make the look great. Finally, follow us on Instagram for more information on new designs. 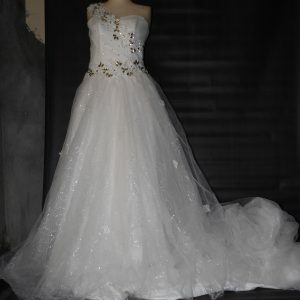 Also, view more wedding dresses to have a perfect option.